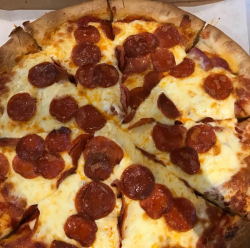 With our large menu and always made fresh pizza, you are sure to find something for everyone. We season our wings with The Original Heffer Dust. Dine in, or call for delivery anywhere in the Santa Maria Valley — we look forward to serving you. We take pride in using the best quality ingredients, our reasonable prices and that our pizzas have substance i.e. two slices should fill you up! We also now offer a thin crust pizza. Catering is also available. Look forward to an outdoor seating area coming soon.